The AV-300 Series terminal units are among the most versatile single duct air control products on the market, providing easy HVAC system integration with diverse control packages. The AV-300/400 Series unit comes standard in several different configurations. The compact design simplifies the building layout process for virtually any application. The efficient and reliable AV-300 Series unit is available with analog or direct digital control options. 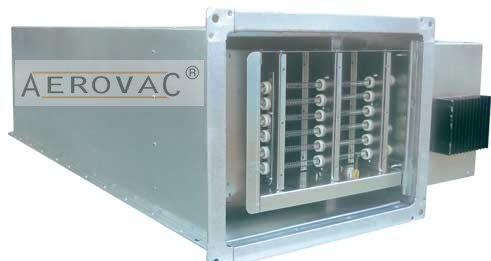 Prime AV-300/400 Series single duct terminal units are designed to be easily incorporated in the overall building HVAC design. Control packages allow the AV-300 Series to be used in variable volume applications. Although designed for compatibility with low pressure (<0.10"PS), the AV-300/400 Series unit performs reliably in high-pressure systems as well (up to 6.0"PS). See the Engineering section for more information. In variable volume pressure independent applications, the AV-300 Series unit compensates for system pressure while adjusting the airflow in response to room thermostat demand. When used in a constant volume application, the AV-400 can maintain a set flow requirement, compensating for fluctuations in system pressure. Interior zones are typically controlled by an AV-300/400 Series with a cooling-only control package; exterior zones are often controlled by an AV-300/400 Series with electric reheat coils and a reheat control package. 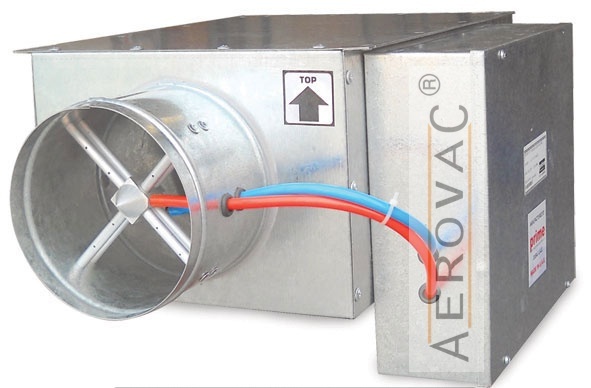 Depending on the layout of the ductwork, it is sometimes more practical to specify the AV-300/400 Series with a single, factory-installed round discharge or with multiple round outlets. 22 Gage Galvanized steel casing construction with a 20 gage casing option that provides strength and product durability. AHRI listings for certified performance in accordance with AHRI Standard 880 testing standard. Suitable for low, medium, or high-pressure application's ability to operate throughout a wide range of HVAC systems. Available "6X9" access opening for easy accessibility during routine inspections and maintenance. Several casing liner options provide quiet and clean operation. Airflow capacities from 40 to 3660 CFM providing airflow control for most commercial applications. Round inlet sizes from 4" through 16" diameter which are slightly undersized to fit standard spiral and flex duct. Digital or analog controls with pressure independent or dependent control packages allow tailoring to many building systems. K4 Line across four quadrants, a multi-point center averaging sensor or optional linear, multiple-point, averaging velocity sensor, offers low resistance to airflow while providing amplified velocity pressure signal to the controller. Gasketed round volume control damper operates over a full 90Â°range and provides a low leakage shutoff position. Compact unit casing sizes accommodate installation in reduced ceiling plenum space. Casing 0.9/1.0 mm (20 gauge) thick Galvanized Steel Sheet. Round Shaft Bar of 12mm Ø Galvanized Steel. All CAV's are mechanically sealed and gasketed for air tight construction. DDC, BMS & Bacnet compactable controls will be supply upon client's request and optional. The extended length of Sound Attenuator's will be supplied on client's request for more sound absorption and optional. Double skin wall with perforated sheet construction will be supplied upon client's request and optional. All CAV's are mechanically sealed and gasketed for airtight construction. Fin tubular or open coil type electrical heater will be provided. On/Off type heater will be standard construction, modulating type (SCR) will be provided subject to the request. The Prime retrofit unit is ideal for converting a mechanical terminal unit into a CAV terminal unit. Designed to retrofit Variable / constant volume units, AV-330/430 retrofit product offers compatible controls for most building automation systems and installation convenience. With prime Retrofit CAV terminals in place, building owners can make use of a variety of fan volume control options. A major concern when retrofitting is downtime. Since the AV-330/430 terminal unit is compact and can be installed through the ceiling grid, installation costs and downtime are reduced. 1. 22 Gage galvanized steel casing construction with an optional 20 gage or (304 / 316) stainless steel casing. 2. Suitable for low, medium, or high-pressure application with the ability to operate throughout a wide range of HVAC systems. 3. Airflow capacities ranging from 40 to 3660 CFM to provide airflow control for most commercial applications. 4. Differential Pressure Grid made of Aluminium is fixed at the Inlet Side of CAV. 5. Modulating Type of Actuators, with 24Vac operating voltage will be installed with Digital Thermostat as a standard supply. 6. Round inlet and outlet sizes ranging from 100mm (4") to 400mm (16") diameter; slightly undersized to fit standard spiral and flex duct. 7. Cast position indicator on damper shaft for easy monitoring of damper position. 8. Bearings are self-lubricating; unaffected by temperature and humidity.